Roughly in the year 1705, a young African boy, acquired from the seraglio of the Turkish sultan, was transported to Russia as a gift to Peter the Great. This child, later known as Abram Petrovich Gannibal, was to become Peter’s godson and to live to a ripe old age, having attained the rank of general and the status of Russian nobility. More important, he was to become the great-grandfather of Russia’s greatest national poet, Alexander Pushkin. It is the contention of the editors of this book, borne out by the essays in the collection, that Pushkin’s African ancestry has played the role of a “wild card” of sorts as a formative element in Russian cultural mythology; and that the ways in which Gannibal’s legacy has been included in or excluded from Pushkin’s biography over the last two hundred years can serve as a shifting marker of Russia’s self-definition. 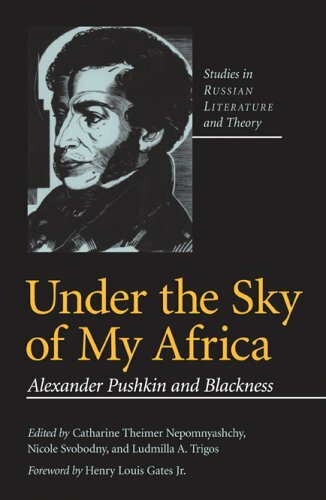 The first single volume in English on this rich topic, Under the Sky of My Africa addresses the wide variety of interests implicated in the question of Pushkin’s blackness-race studies, politics, American studies, music, mythopoetic criticism, mainstream Pushkin studies. In essays that are by turns biographical, iconographical, cultural, and sociological in focus, the authors-representing a broad range of disciplines and perspectives-take us from the complex attitudes toward race in Russia during Pushkin’s era to the surge of racism in late Soviet and post-Soviet contemporary Russia. In sum, Under the Sky of My Africa provides a wealth of basic material on the subject as well as a series of provocative readings and interpretations that will influence future considerations of Pushkin and race in Russian culture.